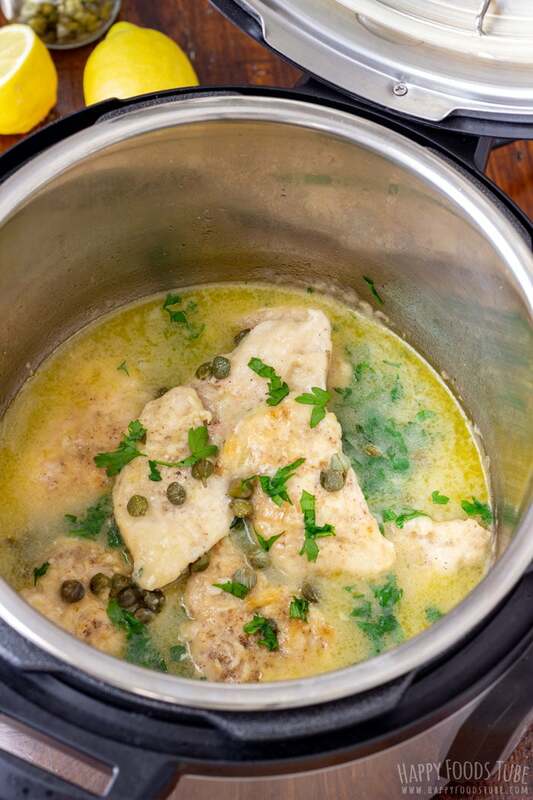 Instant Pot Chicken Piccata is an easy and quick recipe perfect for a weeknight dinner. Chicken breasts are coated in Parmesan and pressure cooked in lemon butter sauce. 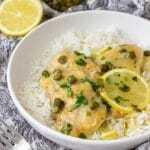 One of the main ingredients for pressure cooker chicken piccata are capers. If you haven’t used them in cooking yet, this is your chance. Don’t be intimidated by their name. They give this Instant Pot chicken piccata its unique flavor. You can also use them in stews or salads or in Puttanesca sauce. What to serve Instant Pot chicken piccata with? It really depends on your preference. You can make orzo, rice, couscous, pasta or potatoes. My personal favorite is rice. The prep is easy but takes some time. You have two options. Either you buy thinly sliced chicken breasts or you will butterfly, cut and pound the breasts yourself. If you are good at butterflying chicken breasts then go ahead and do that. If you are not (like me), don’t worry. They don’t have to be perfect. Just make sure they all have the same thickness so they cook evenly. Pound them with a meat tenderizer or a rolling pin. Tenderizing does not only make the meat tender but also reduces its cooking time. Season each piece with salt and pepper on both sides. After, coat each piece in flour that has been mixed with finely grated Parmesan cheese. Now these chicken pieces will need some browning in your Instant Pot first. When making this Instant Pot chicken piccata recipe I brown the meat in two stages as the pot is not wide enough for me to brown everything in in one go. Once done, deglaze the pot with chicken stock. When done, add butter and let it melt. Then place the browned chicken breasts back into the pot, throw in the capers and squeeze in some lemon juice. Lock the lid and pressure cook on manual for 4 minutes. Wait until the pressure is released naturally. 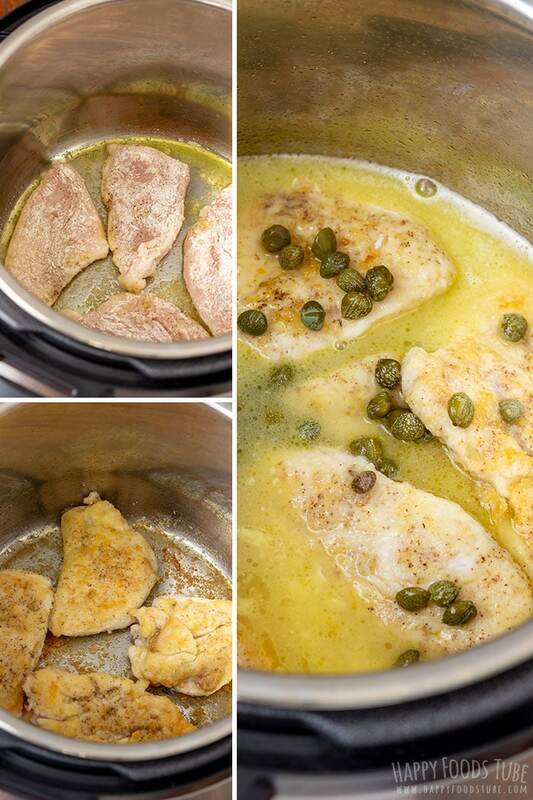 When following this Instant Pot chicken piccata recipe to a T, this will take about 4 minutes. Now it’s time to thicken the sauce with corn starch that has been dissolved in little water. Make sure to always add 2-3 tablespoons of the sauce into the corn starch, stir it and only then pour the corn starch mixture into the inner pot. Finally, add chopped parsley, taste it and add more seasoning if needed. You can also add more capers, if you like. 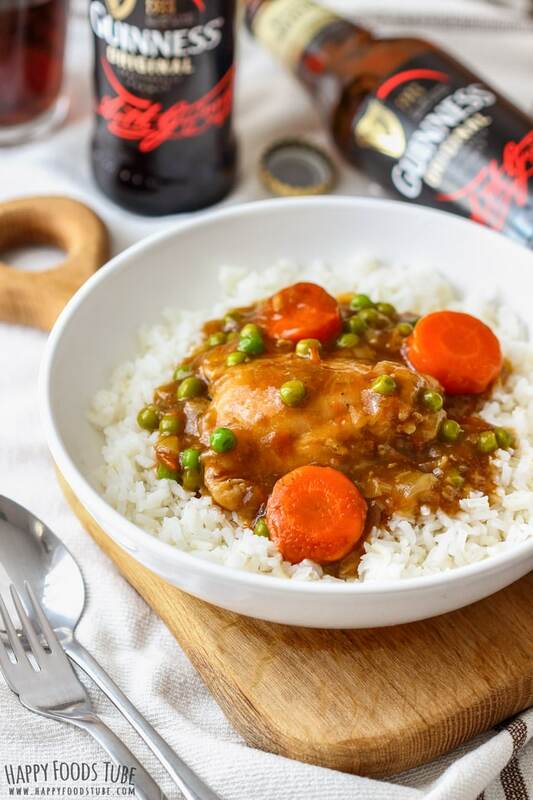 Now this recipe can be easily done on a stove top and even though it might take the same time, I feel like using the pressure cooker gives you amazingly tender chicken breasts. If you don’t have Parmesan cheese, use Grana Padano or Pecorino instead. Capers can be stored in the fridge several months. The important thing to remember is to keep them submerged in their brine. So make sure not to drain the brine. Capers are quite salty so you don’t need to season the sauce much. Wait until the very end and add only after you taste it (if needed). Guys, if you would like to see more Easy Instant Pot Recipes on my blog, let me know in the comment section! Want to see how to make Instant Pot Chicken Piccata? Watch the video! Butterfly the chicken breasts and cut them in half. Pound them with a meat tenderizer or a rolling pin. Season them on both sides with salt and pepper. In a wide plate/bowl combine the flour and parmesan. Now dredge each chicken piece in flour mixture. When done, turn on the SAUTE function on your Instant pot and add the oil. When hot, place the chicken breasts in and brown on each side. When ready, take them out and deglaze the pot with chicken stock. Add butter, chicken breasts, capers and freshly squeezed lemon juice. Lock the lid and pressure cook on manual for 4 minutes. Wait until the pressure is released naturally (this will take about 4 minutes in this case). Remove the lid and take out the chicken pieces. 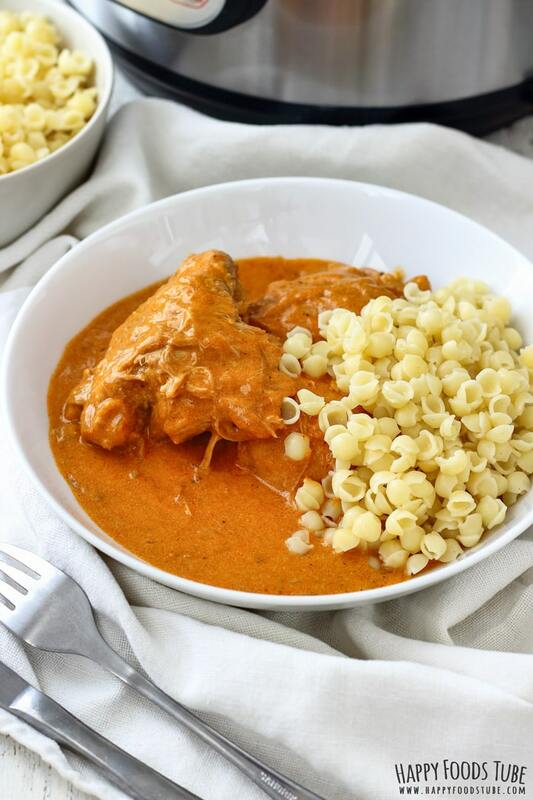 Turn on the SAUTE function and thicken the sauce with cornstarch that has been dissolved in little water + little piccata sauce (Always add 2-3 tablespoons of the sauce into the cornstarch first, stir it and only then pour the corn starch mixture into the inner pot. Let it cook for 1-2 minutes before turning off the pot. Finally add chopped parsley and the chicken pieces. This recipe was developed for a 6-quart/6-liter Instant pot electric pressure cooker. The cooking time does not include time needed for the pot to come to pressure and time needed to release the pressure. Add extra 8 minutes in this case. 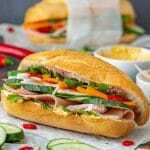 Tenderizing – place the chicken pieces between 2 sheets of baking parchment or plastic wrap before you start pounding them with a rolling pin/meat tenderizer. Browning – the Instant pot is not wide enough to hold all the chicken pieces so you will have to do it in 2 batches. Deglazing – adding liquid like chicken stock to your hot pot will remove all the pieces that are stuck to the bottom of your pot so they will become part of the sauce. Some might not go easily so use a wooden spoon to scrape them off. The amount of capers/lemon juice/corn starch can be adjusted to your liking. Sides – the choice of side depends on your preference. Rice, orzo, couscous or pasta are some great options. 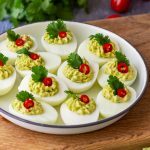 This look delicious and easy to make! 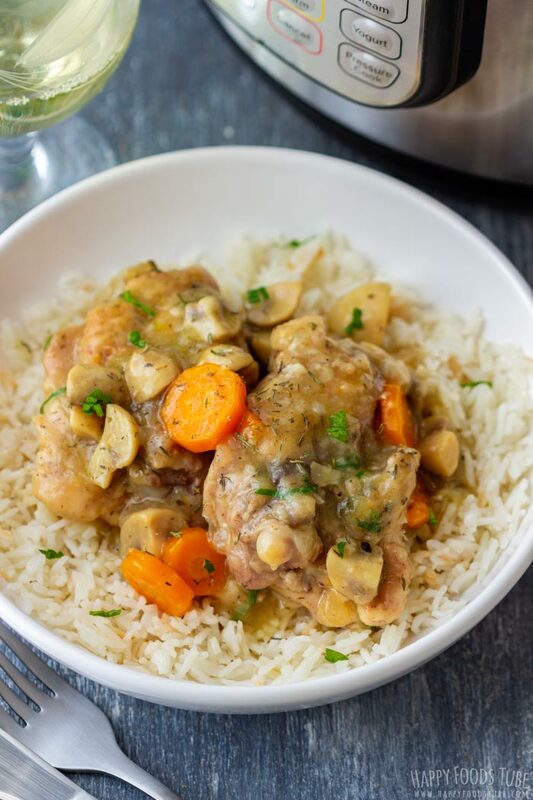 I’ve been looking for a quick chicken dish to try out in my new Instant Pot and this is one that I’ll definitely be trying! 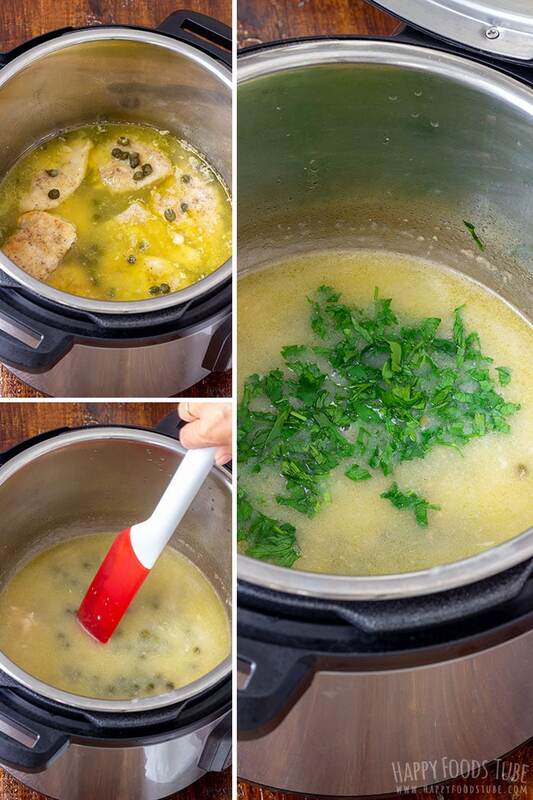 Thank you for going through the whole process with the Instant Pot. I still feel like I’m a bit intimidated when using it. This helps put me more at ease. I just had Chicken Piccato for the first time a couple months ago and instantly fell in love! 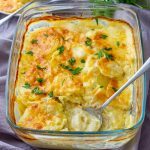 I’ll have to try this Instant Pot recipe though – quick is always a plus in my book! It’s a delicious dinner, isn’t it? 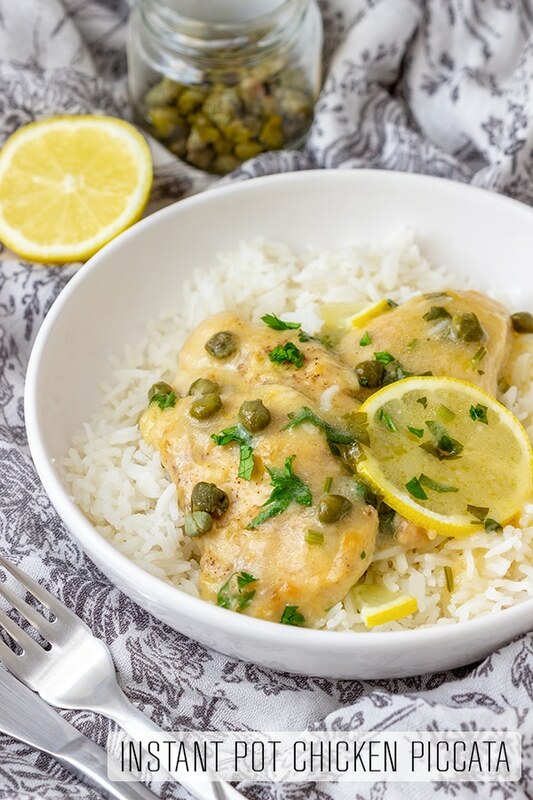 Chicken piccata is one of my favorites and making it in the instant pot is a great idea. I love cooking chicken in my instant pot! It’s always tender but not dry, and cooks so fast! Especially if just doing a few breasts! Wondering how much lemon to put in the recipe. It just says 1/4 lemon, is that 1/4 of a lemon or 1/4 cup? It’s 1/4 of a lemon, Debbie. I’d say about 1-2 tablespoons. 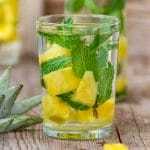 You can add more at the very end after tasting it, if you prefer more lemony taste. Hope this helps. So happy I found your yummy recipe! 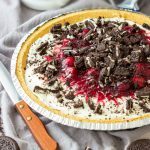 I had to adjust for dairy & gluten free – I used Earth Balance & GF flour and it turn out just fine. I also pulled the chicken pieces out after cooking for the 4 minutes. I added some GF pasta into the Instant pot along with the liquid the chicken had cooked in and added some GF pasta. I added about a cup more chicken stock to almost cover the pasta. I put the lid on and cooked the pasta on high pressure for 4 minutes with a quick release and then added the cooked chicken back into the cooked pasta in the instant pot. The pasta was the perfect compliment to your super yummy recipe! This recipe is a keeper for sure! I was looking for a quick chicken entree without tomatoes and came across this recipe. Sounded good, only a few ingredients, so I gave it a try. Quick, quick in the Instant Pot. I had mushrooms on hand so added those too. It’s amazing! Will definitely be making this again. Highly recommend!! Adding mushrooms is a great idea, Patty. I am so happy to hear you loved this recipe. Thanks for your feedback! I would reduce the corn starch for a more authentic Chicken Piccata – other than that it was pretty good! Hi Alex, thanks for your feedback! Hi Julia! This was great, thank you for the recipe. I made twice the sauce used a roux with 3 tbl butter and 3 tblsp flour just because I’m not a cornstarch fan. Added packaged grilled artichoke hearts I bought at Whole Foods non marinated and sliced mushrooms during the reduction phase. It was fantastic! Your timing etc was spot on. Also, by the way, your creamy tortellini soup is very nice. Again thank you, I look forward to following you. 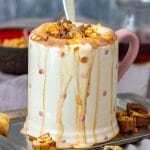 If you are ever interested in recipes I’ve had success concocting, it would be fun to share. Hey Lori! Thanks for finding time to leave the feedback and tips. I am glad the modifications worked for you! Tortellini soup is one of my favorite ones to make in IP so glad to hear you also like it. 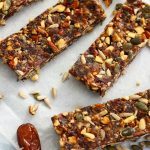 Please feel free to let us know about you tweaks to my other recipes when you do give them a go! 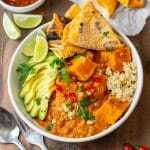 How can I double this recipe in an instant pot/pressure cooker. I haven’t doubled this recipe but would suggest doubling the first 6 ingredients. Then depending how much sauce you like you can either keep the same or double that too. The pressure cooking time will stay the same. Hope this helps. This was outstanding! Followed the recipe exactly for ingredients etc. BUT the NPR was closer to 20 min and not 4 min. The chicken was moist and tender though. Not sure why the NPR took so long. Def make this again! Hi Cher, thanks for your feedback! I’ve recently noticed that the NPR is not always the same for every pot (not sure why this is though). Lovely dinner tonight. Thank you for the recipe. I served it over herb noodles. I’ll be making this over and over. 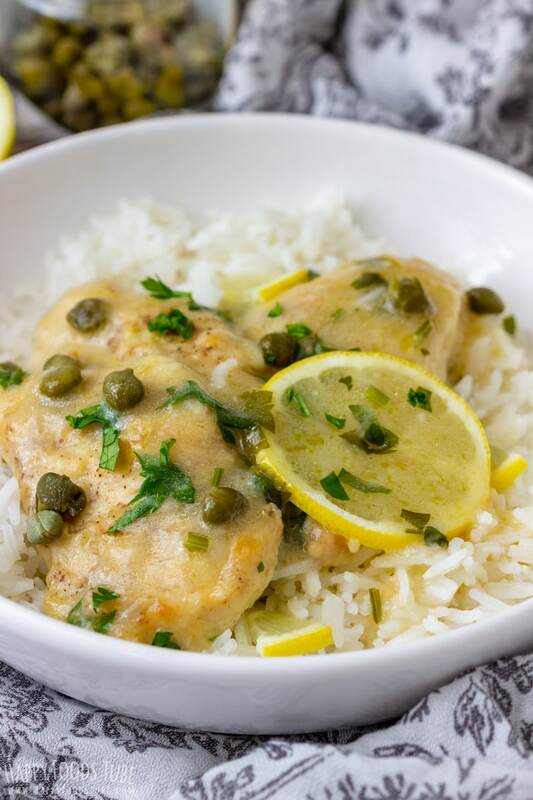 The perfect chicken piccata! Other recipes have you adding sliced lemon to the pot, which I found made a bitter taste. This was really delicious!!! Thank you!! I am so happy to hear you enjoyed this dish, Stacy! Thanks so much for your feedback! I made this tonight….served over jasmine rice. I did nirvana have capers but steamed up peas and mushrooms and added that in…more lemon juice. Looking forward to trying it.